I 750. ALL BRASS UNIVERSAL RING DIAL or mariner's sun clock. English circa 1790. Unsigned. Beautifully crafted and engraved with the outer ring graduated 0–90 degrees on the back and twice on the front. Folding inner chapter ring with two sets of Roman numerals "I–XII". Bridge with sliding cursor that is engraved both sides with months, Zodiacal signs and solar declination scale. Sliding suspension mount and ring. Overall diameter 5". Has a beautifully made brass display stand which allows the instrument to easily be rotated or removed. Condition superb. 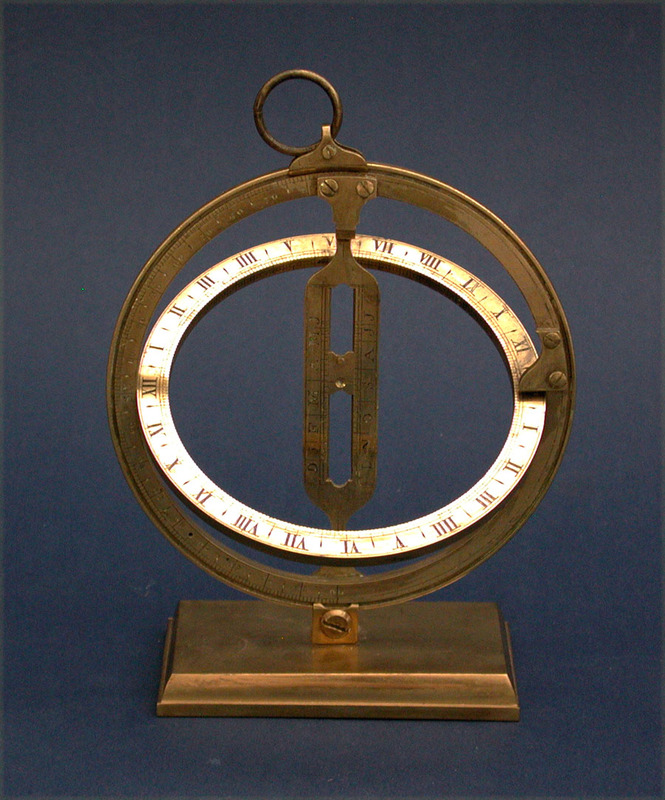 The universal ring dial could be used on land or at sea to obtain local solar time by knowing only the date and latitude without the use of a compass. A very nice example.